Penny White, oh Penny White! How I’d love to spend a day in your orbit, sharing a dram of Talisker… or better yet, maybe some of Hreinalög’s thirty-year-old stash? Since that’s not likely to happen, I’ll settle myself within the pages of Ms. Cymri’s books about you. This second installment, Cult of Unicorns, elevates tensions nicely. A human is found murdered, his death apparently caused by a unicorn… But that’s not possible! Unicorns are above reproach: pure, judicious, saint-like. Right? Right? Good and evil. Black and white. It’s clear as day! Grey zones abound, though, as we watch Penny try to solve the case, come to terms with her fledgling romance with the gentleman Inspector (count me squarely on team Peter btw), grapple with her mixed feelings about Raven, and struggle to reconcile the ravenous appetites (both for fresh meat and for knowledge) of Clyde the snail-shark. Add in some tensions with her grieving brother, a request from her Church superiors to host a documentary crew filming in her parish, Morey’s newfound love, and Lloegyr’s barely contained political turmoil and you know Penny’s got her hands full. Thankfully, her four favorite medicines are there to assist her: ibuprofen coffee, alcohol & God (in no particular order). The coexistence of our realm and that of Lloegyr is becoming more complicated… and dangerous! 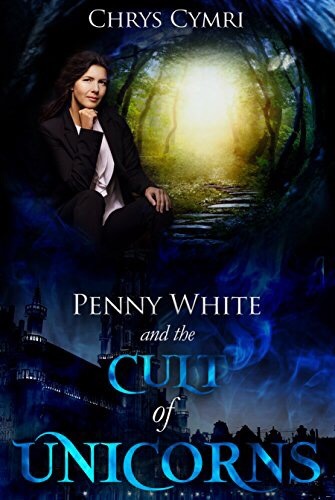 Penny finds herself in jeopardy on more than one occasion, and witnessing her wit and cunning in talking her way through to the other side is always a delight. I really appreciate the way Ms. Cymri allows Penny to be a human being. Yes, she’s a priest, but she’s not perfect and she’s not above temptation. She struggles through real issues, including the impossibility of pleasing everyone, yet she really tries. She makes mistakes, she sometimes acts without thinking of consequences, but her heart is in the right place. As with the first book, I lost track of my laugh-out-loud moments. I can’t wait to see what the third installment brings. You know you want to visit Lloegyr too! This book is available via Kindle Unlimited HERE so check it out.